If the two people in this photo weren't famous, it would be quite the optical illusion. Is the guy on the left some kind of bearded mini-person, or is the guy on the right a gigantic mutant? I can't tell! 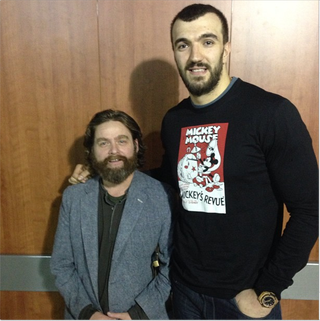 According to Kevin Love, who posted this photo to his Instagram account, Pekovic is a huge fan of Galifianakis. Let's hope this leads to the big man making an appearance on Between Two Ferns.